Want to knock New Zealand off your bucket list? Have you already been there and are dying to return? Now is your chance! 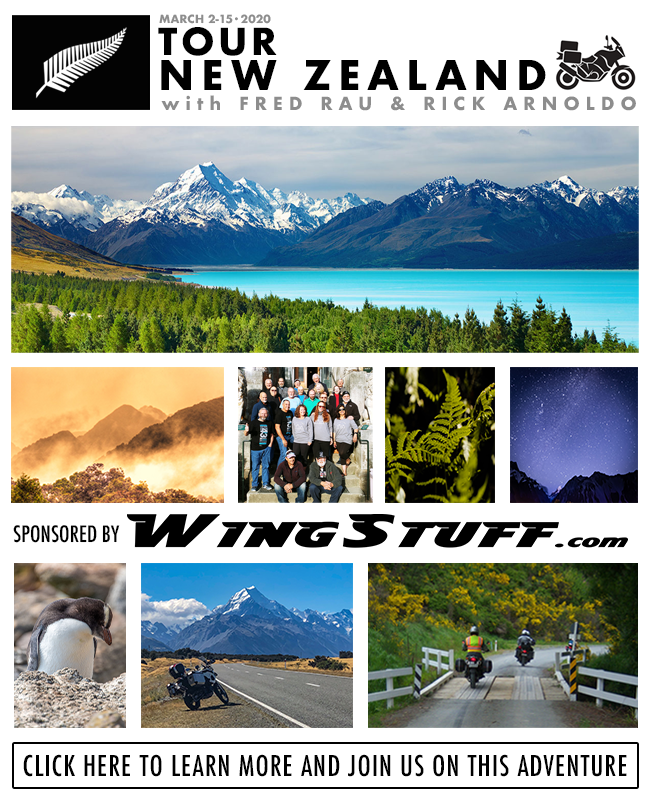 Tour New Zealand with the country's largest and most-experienced motorcycle rental and touring company with tour guide Fred Rau and sponsored by WingStuff. Rick Arnoldo, WingStuff President, will also be joining this tour of a lifetime. Click here or the image below to learn more. Tour dates March 2-15, 2020. Space is limited, so if interested you will want to book early, especially so that you can have first preference on your motorcycle! I won't admit to begging, but let's just say I'm on both knees, hands clenched with eyes like a beagle focused on my wife right now. "Attached is a list of bikes and prices. As you will note, we do not offer Gold Wings. Wings are virtually nonexistent in New Zealand, as they are simply too large for the roads and type of riding you will find there. Same with Harleys. Most roads are narrow, two-lane, twisty with little or no shoulder. They are tight and steep enough that you will find yourself riding all day without getting above third gear sometimes. The largest bike we offer is the BMW R1200RTW, which is quite well suited for two-up, but of course also the most expensive. Price for the rider is $12,695 NZ, and for the passenger $8256 NZ, for a total of $20951 NZ. At current exchange rates, that would be $14,245 US." Let's not turn this into some kind of argument about gun control or anti-trumpism. This is about NZ's awesome scenery and potentially riding through it. Hell, I'm still on my knees beg.....errr, still talking with my wife about this. Clay. This $14.245 what does that include?? "Price includes 13 nights lodging, all breakfasts, 11 dinners, airport transfers, interisland ferry, motorcycle rental, luggage van, tour guides, maps, GPS (if desired), one night at Larnach Castle, a visit to the Mi Tai Maori Village & much more! Personally-guided by motorcycling guru Fred Rau, with bikes and lodging arrangements through Te Waipounamu, New Zealand’s largest and most-experienced motorcycle rental and touring company." And please remember I'm just another rider showing interest. I am not associated with this...just asking Fred the questions. Last edited by clayusmcret; 3 weeks ago. Reason: Pulled live link. I’ve toured both North & South Island and it is a unique and beautiful country. I preferred S.Island as it is much more rugged and mountainous, much like Alaska. Really strange animals and friendly people. Best of all, there are more sheep than people. However, they drive on the “wrong” side of the road and it takes constant attention to stay on the correct side. In a group it is more follow the leader but coming out of a roundabout can be really confusing. I decided to drive a car as there is a constant reminder of being “wrong” but on a bike there’s no steering wheel. It takes a while to get accustomed to the difference. Both NZ & Australia are expensive and they don’t have the plethora of hotels as we do. Accommodations are expensive. I remember one restaurant where a steak was around $50 and I had to cook it myself. Makes the "included items" sound better. To be honest, a tour of this caliber at roughly $1000/day really isn't that bad. I hope it goes off well - good luck!! Wife and I were part of an organized bus tour of both islands of NZ two years ago. Yeah, I know...a bus...🙄. But, it was fun and beautiful! I was surprised how few motorcycles there were on the roads. The north island is very agricultural. Lots of dairy farms and sheep. Incredibly green. Auckland is a big city and probably ok but I was glad we spent very little time there. Once you leave Auckland there is not much traffic but most of the roads are slow going. Even though it was March/summer in southern NZ, we were unable to see some areas because the mountain roads were closed by heavy snowfall. I would prepare for southern NZ like I would for a June or September ride in Alaska. Get an R1200GSA and go see where the LOTR and X-Men were filmed... Sounds pretty amazing to me. Christchurch was still in recovery mode when we were there. It was sad to see. A. V. Dicay got it right in 1914, over 100 years ago . Check out who Obama has working for him. Can anyone recommend a bus or trolly tour of New Orleans that has parking at their depot? We're staying in Slidel, LA and want to ride into the city but don't want to ride around the city.